Bolton chairman Phil Gartside and former manager Sammy Lee are among 11 parties who have been summonsed to answer perjury or fraud allegations, BBC Sport understands. Ex-Bolton player Gavin McCann and several football agents must also appear at Newcastle Magistrates' Court. The summonses relate to a civil case brought by football agent Tony McGill. Gartside faces five perjury allegations and one of fraud, relating to making "false and representational contracts". The allegations date back to June and July 2007. The case is the latest brought by McGill in a long legal battle relating to his claim that he was excluded at the last minute from the £1m deal that took McCann to Bolton from Aston Villa that summer. He has previously claimed that Bolton brought in sports agency SEM to take the job off of McGill - losing him his agent's cut of the deal. Lee, who was Bolton manager at that time and is now a coach at Southampton, must answer four allegations of perjury. Former midfielder McCann faces four allegations of perjury and one of fraud. Former Bolton director of football Frank McParland is also accused in relation to four allegations of perjury. 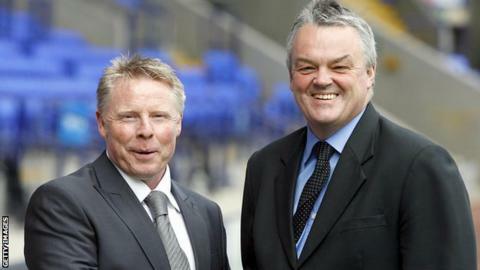 McParland is now director of football at Brentford and was also Liverpool's chief scout from 2003 to 2007. BBC Sport understands that the other parties are football agents or agencies. The hearing is scheduled for 25 February at Newcastle Magistrates' Court.